Prepare to be transported to the delightful seclusion of Harrop Tarn above Thirlmere, walk with Wordsworth around Rydal Water, experience the tranquility of Tran Hows and the majestic grandeur of the Langdale Valley. This DVD is a series of four walks around some of the best loved scenery in the British Isles. All walks are circular, and should all be accessible to walkers of all ages and abilities. 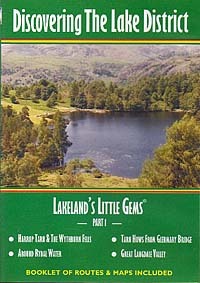 A booklet of walks and maps is included.